Our skin may be only a few millimeters thick, but it is the largest organ of our body, and it plays a critical role in our health and well-being. It is our first barrier to fight illness and disease, and is a passageway to our bloodstream. It helps regulate body temperature, and allows the sensations of touch, heat, cold, as well as sensual and emotional sensations. It provides the first signal to our brain that we’re being hurt, which helps us react quickly to prevent a worse injury. It helps our body get rid of toxins and prevents chemical and waste build-up. It protects our body from the harmful effects of the sun and radiation. It is responsible for producing vitamin D during exposure to sunlight (which in turn helps our body to absorb calcium, promotes bone growth, muscle function and supports the immune system. Studies suggest that Vitamin D might also help prevent a variety of cancers). Our skin constantly sloughs off dead cells. This gives way to new, living cells that move up from the lower layers of the skin to the top layers. It takes roughly one month for new cells to get all the way to the top layer, meaning a month from today our skin will be completely new compared to the skin we have now. This continual renewal keeps our skin looking younger, smoother and more radiant. With age, this natural skin cycle slows down, which can result in an accumulation of dead skin cells on the outer skin layer. This buildup makes our skin appear dull and darker, and leads to blemishes and more fine lines. Exfoliation removes dry, dead skin cells on the surface of the skin and is one of the most important aspects of our home skincare routine for face and body. Exfoliation not only helps many skin problems, it also increases blood circulation, which helps us achieve healthy and glowing skin. Breakouts and blemishes: After having a blemish on the skin there is sometimes a dark mark that lingers for a while. The best way to fade it is to exfoliate twice a week to remove those damaged skin cells and encourage new healthy skin tissue to grow through. Clogged Pores: Exfoliation helps to draw out congestion, otherwise known as blackheads and whiteheads. Most common areas for breakouts are the nose, chin and forehead. Remember, twice a week tops. Pigmentation: Pigmentation is the dark areas that appear due to age, pregnancy and changes in our hormonal balance. Exfoliation is beneficial for breaking up pigmented cells, encouraging them to fade. Dry Skin: When our skin is dry or dehydrated, it may become scaly or flakey. Exfoliating and then moisturizing will return our skin to a healthier state. 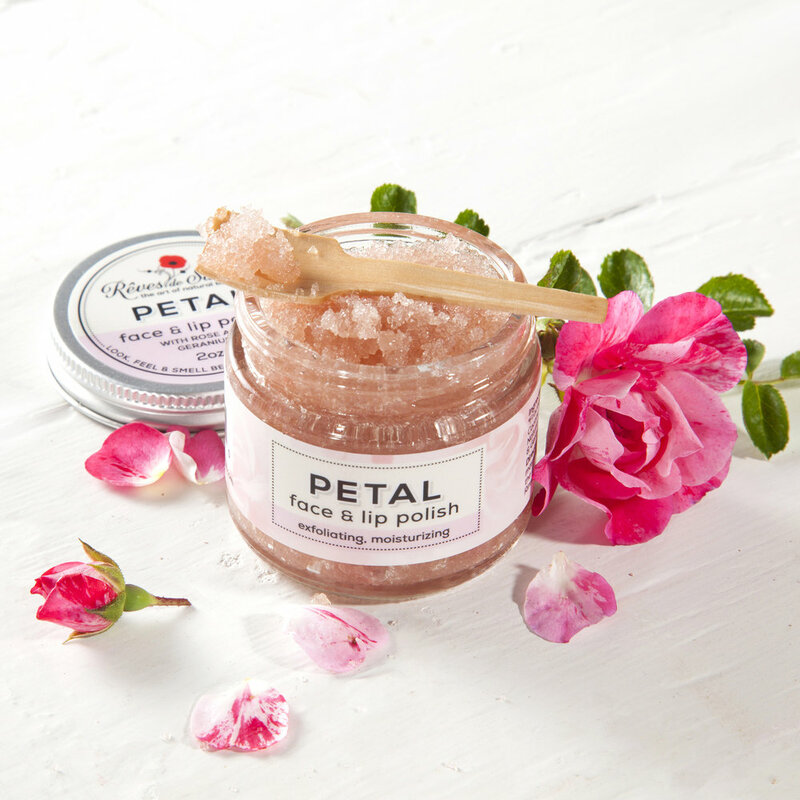 Sugar is a wonderful exfoliator, and one of the ingredients in Rêves de Sabine's Face & LIP Polish. Ingrown Hairs Leg or bikini line waxing pulls the hair from the root. Although the hair will eventually grow back weaker, it sometimes cannot pierce through the skin and a red spot will appear around the hair. 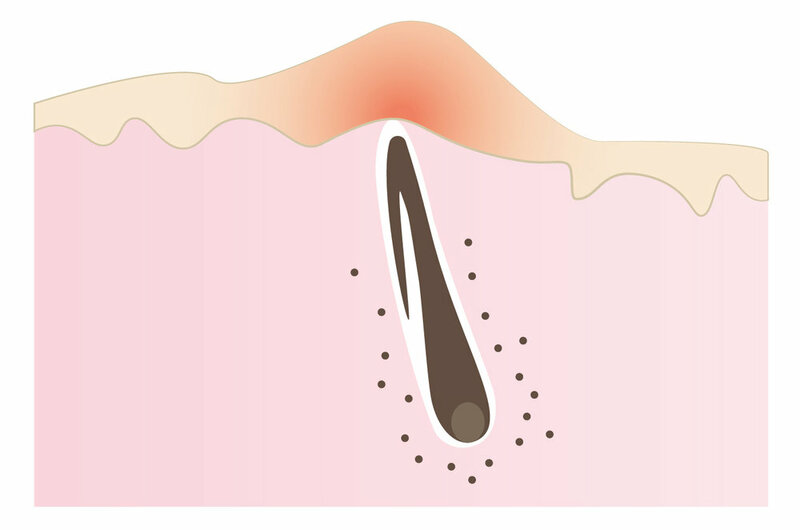 This is an ingrown hair. Exfoliation will remove dead skin and allow the hair to break through the skin. I would suggest exfoliating once or twice a week for the face as part of a good home care regimen. It is important to remove dead skin but it is also important not to strip away our natural oils, so a good balance is essential. 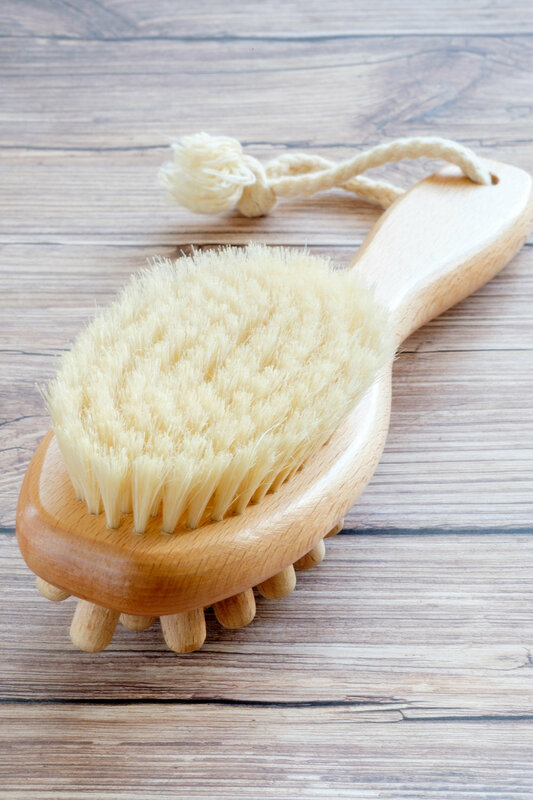 Body dry brushing can be done almost daily, as long as it is performed in a gentle way. Unclogs our pores. Increases circulation. Reduces muscle tension, calms the mind, and relieves stress. 1. Use a firm, natural-bristle brush. 2. Take about 3-5 minutes to dry-brush your entire body. I prefer dry brushing in the morning before showering, as it is invigorating and prepares my skin to absorb my No Cellulite Body Oil better. 3. For lymph flow, always brush upwards towards the heart. Start with your feet, and make sure your entire body is brushed. Use sweeping strokes, starting from the bottom of your feet upwards, and from the hands towards the shoulders, and on the torso in an upward direction (stroking away from your heart puts extra pressure on the valves within the veins and lymph vessels and can cause ruptured vessels and varicose veins). Brush gently in a circular motion around the base of your neck, armpits, breasts/chest area, and entire abdominal area. 4. Apply enough pressure to stimulate circulation, but don't brush too hard! Firm but smooth strokes work best. Skin should be slightly pink after brushing, but it should never be red or sting. Use lighter pressure in areas where the skin is thin and harder pressure on places like the soles of the feet. 5. Step into the shower and wash off the dead skin cells that are still on the surface of the skin. 6. Massage in an all-natural body oil or moisturizer. Do not forget your hands and your feet. If you are concerned with skin tone or cellulite-prone areas, use a stimulating and toning oil such as Rêves de Sabine No Cellulite Body Oil. Massage in until fully absorbed. Note how energized you feel after dry brushing. You’ll get hooked (in the healthiest way)!